A new student starts – you explain to them and their parent(s) all about how they must practice at least half an hour a day, and you have a great first lesson. They come back the next week, and they have practiced well – its all new and exciting, their book is brand new, shiny and clean and everything is still very much fun. Then the same thing happens two weeks later, now this time there is even more stuff which the student has not practiced and can’t do. By this time you are tearing your hair out – because you’re teaching them the same thing they did last week again. The job feels like it is hard work, and its not the reason that you enjoy teaching! You know that at some point you are going to get that phone call from their parent saying “We think we might just have a rest for a while – we are doing sport at the moment and have lots on our plate”. You know what this means; it means that they want to quit because they don’t feel the child is getting enough out of it to be worth their money. Music teaching should be FUN! It should be enjoyable for the child to get satisfaction from playing their instrument, and it should be enjoyable for the teacher and the parent as well. Learning music should be a pleasurable activity. The issue is though that to learn to play any instrument, whether it be piano, a wind instrument or a stringed instrument takes commitment, energy and hard work. You notice I didn’t say talent? – I think talent is definitely over-rated as a factor in the evolution of children into musicians. Talent is something that one person in a million has for a particular thing, and very likely that person might never do anything with it. Talent or aptitude is neither here nor there with most students, and as a teacher or a parent we have the ability to train any student, no matter how much natural talent they have. It’s the commitment, energy and hard work where sometimes the pleasure and the fun can be lost, and that’s why as teachers we need to constantly find ways to balance those things with FUN and REWARD. 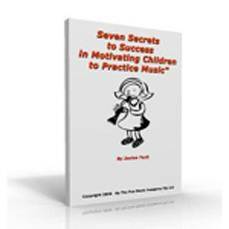 Through my years as a music teacher, and together with my husband in our own music school we came up with a few strategies that worked every time. They turned around students from not practicing AT ALL to practicing every single week without fail! These charts and stickers are designed to help make music practice fun, and to encourage achievement. It is up to the child’s teacher, in consultation with the parents to set the practice expectations, and these materials will assist in keeping records and inspiring the child. There are three sets of materials, which can be adapted to suit the needs of individual children. This system is ideal for very young children. Practice sessions do not need to be timed, but the expectations need to be set by the parent and teacher together of what constitutes “practice”. In this system the teacher gives the parent a page (or sometimes just a few printed strips) of stickers to take home. The parent or teacher writes down the tasks for the week in the left large box, and during the week when the child completes a practice they place a small “music note” sticker in the relevant day’s box. The parents obviously have to take an important role here in supervising the practice, and controlling the stickers. At the end of the week or at the weekly lesson the parent or teacher can place a weekly “This week I earned” sticker in the large box on the right. 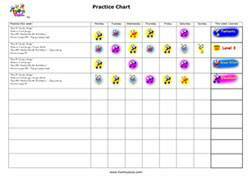 A chart is included that you can place on the wall in the room, so that the child knows what they are aiming for with the weekly sticker. If the child is always doing the maximum number of practices, then it is time to use the “music award” stickers. You can even give a music award if the child has improved very well and not practiced every day, or for any other reason. It helps to break the monotony – as children will get lazy and only do the minimum required to get the sticker, and not worry about trying to improve. This system is ideal when the “spark” has diminished from the first system. Get the child to time themselves practicing, and put the relevant sticker in the box (5,10,15,20,25 or 30 minutes). You can then use the same weekly stickers as for Set 1. This system can transist a child away from using stickers, to more adult learning systems such as diaries. All you have to do is get them to “Tick” the boxes when they have done the task each day, and then you can still give them a weekly sticker in the “This week I earned” box. I would be the first to say that not every student needs these things. Older students, students who are doing examinations and students who have very motivated and committed parents don’t need these sort of practice incentives. However, it is the YOUNG, relatively new student who NEEDS this type of practice motivation, as they simply don’t have the experience and motivation to practice by themselves. This practice system can turn around a student and instead of them quitting they can become an exam student and stay with you for years. It doesn’t need to cost you a cent! Now these strategies are available to you FREE! – You’ve read this webpage, you’ve seen what the stickers and the practice charts look like. If you are reasonable clever on the computer I’m sure you can work out how to make the charts up. The thing that I’d like you to think about is your time. Each of the practice charts as a customizable Microsoft Word document, so you can add your own studio name and phone number to it! *You need Microsoft Word or a compatible word processor to utilize these customizable templates, but the PDF files will print on ANY computer! These materials are supplied in Adobe PDF form, so all you have to do is hit the “print button” and you’ve got it for your students, printed nicely on A4 or letter paper. BUT… if you are a little more computer savvy we also supply the Microsoft word documents, so you can customize them as you need. Suppose you need only nine spaces instead of 10 on each sheet? no problem! – you can change it! 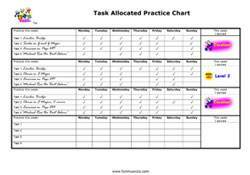 Suppose you want five tasks each week on the task related sheet? Most importantly you can have YOUR name and phone number pre-printed on it. 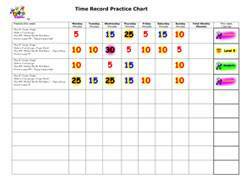 Think about that – the practice chart gets put on the fridge at home, and you are constantly in the parents mind, and when friends come to their house it’s a talking point – Who are they going to call for music lessons? 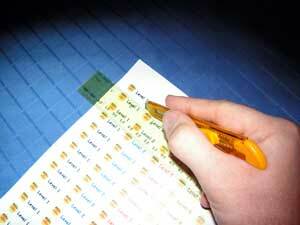 Don’t waste money on pre-printed stickers – Print them yourself! When I started teaching I had to BUY fancy preprinted sticker packs – this would cost a minimum of $5 a pack of 100 stickers, and the cost really added up over time. With the Ultimate practice system stickers you can print them on your home computer, and you simply get sticker paper from the local office supply shop. This costs maybe $20 – $30 for a packet of 100 sheets. Heres the thing: EACH SHEET gets 120 of the large stickers, or 240 of the little “Dots” on it. All you do is simply cut them out with a craft knife and you’ve got your own stickers – as many as you need! It doesn’t take a mathematician to work out that you are saving money, even after factoring in the cost of printer ink. This little e-book is the ideal companion to “the Ultimate practice system” as it contains many of the strategies I used in conjunction with the charts to inspire and motivate children to practice. The “Ultimate Practice System” is by no means a complete product that will never be upgraded. It will have revisions from time to time, and as teachers and parents provide their feedback we will add more to it over time. 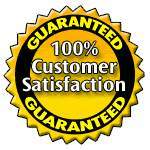 As a paid member you will get lifetime access to the product, and we guarantee that we will never charge you for access to the same product again, ever! You simply get a username and password, and you access the “members only” website to download your materials. If your computer crashes or you move and lose the materials, then you can simply download them again. Its THAT simple! So for the ridiculously small investment of just $9.95 you can have access to all these materials, and save yourself hours and hours of time and frustration in creating them yourself. If at some point in the future you decide you’d like to get the games as well, then you’ll receive a special discount equivalent to the purchase price, so that you are not paying any more to receive both. So, on this page you’ve learned the strategy – now all you need is the materials. You have two choices, you can spend hours and hours looking for the artwork, working out how to create the charts, writing letters to parents and thinking about how to implement it. I know which I’d choose, as I value my time, and for around the money I earn from less than ONE LESSON I can have access to heaps of materials which will save me money AND help me build my teaching business. P.P.S You really have nothing to lose, and everything to gain with this deal, as you can always get the games later and you’ll get your purchase price back.